A Christian Finishing Course For Young Women! "They say God loves everyone...but does that mean He truly loves me?" "Is inner beauty really more important than outward beauty?" "What does God think about relationships with boys?" Young women are asking questions like these all across the world. Sadly the answers are harder to find than ever before, as the negative messages in today's society leave no room for Godly principles. Just what exactly should every girl know? 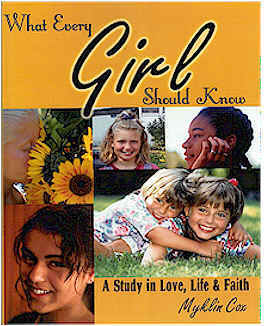 Myklin Cox takes preteen and teenage girls through an enjoyable and personal journey to discover what the Bible says about What Every Girl Should Know. This Christian Finishing Course for young ladies openly discusses practical and spiritual issues in a way girls can easily understand and apply to their lives. With your purchase of What Every Girl Should Know, you will also receive an e-book version of the workbook's corresponding Leader's Guide at no additional cost!